The International Bee and Bowl is an International History related quiz competition taking place in more than 100 countries in the world. After the series of qualifying series of tournament, The International History Olympiad is going to be held in Hawaii, the USA in coming June 2016. The International Bee and Bowl held its inaugural History Bee and Bowl for the first time in Nepal, at Bouddha Meridian School , JorpatiKathmandu.It has opened the door for Bouddha Meridian School, Meridian International School and Ullens School to participate in 2016 Asian Championship and 2016 International History Olympiad to be held in Thailand and the USA respectively. Team Independent (Miss. AvaniAdhikari) and Ullens School achieved first and second position in History Bowl Championship in high school category, whereasBouddha Meridian School and Meridian International School achieved first and second in History Bowl Championship in middle school category. Similarly, Mr. HrithBikramAdhikari fromBouddha Meridian School and Miss. AvaniAdhikari (Independent Team) receive gold medal for Middle School History Bee and JuniorVarsity History Bee respectively. 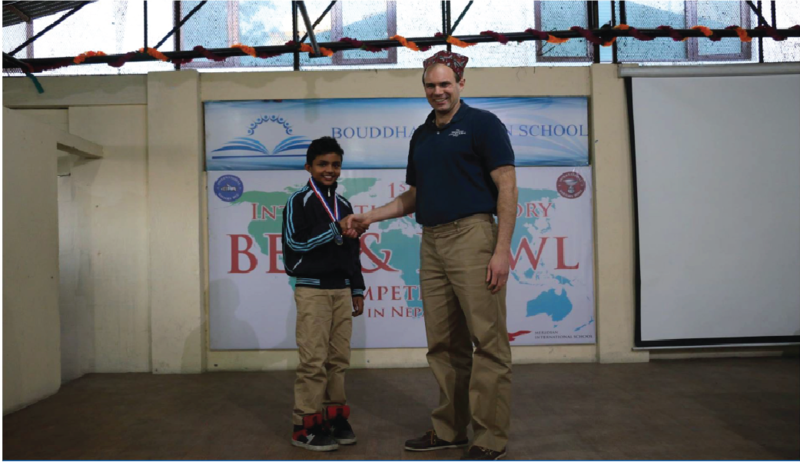 The championship ended in electrifying crowd of students during which Mr. David Madden, Founder Executive of The International Bee and Bowl expressed his notes of gratitude and thanks to Bouddha Meridian School for the arrangements to organize theinaugural championship in Nepal.